For many California families, it isn't summer until you bust out the recreational vehicle. Planning summer trips, excursions, and adventures is often the summer goal for many residents in California. Recreational vehicle parks around the Redlands area can book up fast with those looking to camp out for the weekend and plan a fun getaway for the entire family. When you are scoping out a recreational vehicle park to stay at during your trip, it is important to do your research and call ahead to ensure that they have the amenities you need before staying. If you have children, are you looking for a place with a pool or near a lake to cool down? Do you want restrooms and showering facilities outside of your camper? Do you want basketball courts and other outdoor entertainment at the RV park? You will also want to ensure that the RV park has amenities that you require for your recreational vehicle. For example, you'll want to ensure they have electrical and water hookups, as most parks do. Some RV parks also have amenities such as Wi-Fi capabilities, cable television, and other beneficial luxuries that may make it a more desirable place to stay. This may be best if you want some modern accessories to accompany you on your trip, or have to work remotely while you're on the road. Calling ahead to some of these locations can give you a better idea of what you can expect when you arrive. Redlands California has many benefits to the everyday traveler, and those with recreational vehicles can enjoy the outdoors without having to worry about a safe place to sleep in case weather gets bad. There are many places to sightsee in California, making it a popular RV hotspot for travelers from all over the United States. 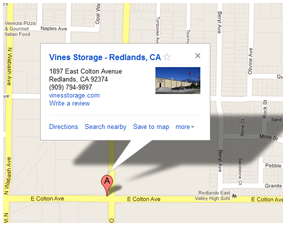 If you live in the Redlands CA area and are interested in finding a quality place to store your recreational vehicle during the off-season, call Vines Storage today and learn more about our long term and short-term storage unit leasing plans! With indoor and outdoor storage available, you will be able to find the storage solution that best fits your needs and desires!